You might not consider it a franchise, but the Teen Titans have been published in some form almost constantly since their 1980 revival — and had runs in the 1960s and ’70s. Depending on how you count them (DC hasn’t grouped them together in its solicitations), the team has three titles as part of the relaunch. The parent title is naturally The Teen Titans, this incarnation written by Scott Lobdell (who’s also writing Superboy and Red Hood and the Outlaws for the relaunch), with art and covers by Brett Booth and Norm Rapmund. The team features Tim Drake as Red Robin (whose own series is mysteriously absent from the relaunch). The team also features Superboy, Wonder Girl, Kid Flash (who may be Bart Allen or may be a new character), and (judging the book by its cover) what look like a couple other characters. Deathstroke, a villain, mercenary, and occasional antihero who debuted in New Teen Titans #2 (Dec 1980) and has been (sometimes vaguely, often explicitly) in the team’s orbit ever since, gets another solo series, written by Kyle Higgins, with art and covers by Joe Bennett and Art Thibert. Hawk and Dove, one of whom is a pacifist and the other a bit of a violent warmonger, debuted on their own in 1968, without the Teen Titans, but their own series quickly floundered and they fell into the Teen Titans orbit. Their highest point creatively came in a violent five-issue 1988 mini-series, scripted by Karl and Barbara Kesel, with Rob Liefeld pencils and Karl Kesel inks, which starred a female Dove. (The original male Dove had been killed in Crisis on Infinite Earths, and a female Dove helped to add to the contrast between the two characters.) This led to an ongoing series for the pair, which lasted just over two years. The duo was reinvented wholesale for a five-issue 1997-1998 mini-series before returning, in various iterations, in the pages of Teen Titans. Then, among its other questionable resurrections, the crossover Blackest Night brought back the original male Dove. The pair have since enjoyed an elevated profile by their appearances in that crossover’s follow-up, Brightest Day. This new series is written by Sterling Gates, with art and covers by Rob Liefeld. Comics fans are sure to balk over Liefeld’s involvement, since most only know him as the artist who was popular at Marvel in the early 1990s, before co-founding Image Comics — only to later contentiously leave the company he founded. Liefeld has a bad reputation, not only for lateness with his artwork and failing to complete projects but also for losing negatives of artwork his companies commissioned and for being called a jerk by his peers. And it’s certainly strange that, as part of its relaunches, DC has turned to Liefeld, writer Fabian Nicieza (on Legion Lost), and (on other titles, including The Teen Titans) Scott Lobdell, all of them most associated with the early 1990s and a style that has since fallen out of fashion. But while Liefeld’s artwork changed since the 1988 Hawk and Dove mini-series, it’s worth mentioning that he has a history with the characters. And while the phrase “the high point of Hawk and Dove history” isn’t saying much, Liefeld was a part of that, and this new series makes sense, from that perspective. Of course, this doesn’t mean that comics fans will pick it up in numbers sufficient to avoid cancellation. The parent title here is the relaunched Legion of Super-Heroes, written by Paul Levitz, with art and covers by Francis Portela. Levitz is the most “classic” of all Legion writers, having written the series from the 1970s through the 1980s, but his involvement comes as no surprise, since he returned to the series a few years ago. 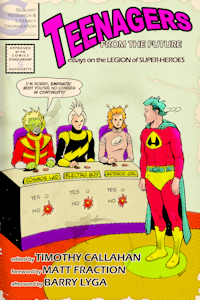 The second Legion title is Legion Lost, written by Fabian Nicieza, with art and covers by Pete Woods. The series takes its title and much of its premise from a 2000-2001 mini-series, which replaced the existing title for a year, followed by a relaunch. There, various Legionnaires were thought lost, although they had only been vastly separated from the main team — and from civilization as they knew it. Seven heroes from the 31st century have traveled back to the present day. Their mission: Save their future from total annihilation. When the future tech they brought with them fails, they find themselves trapped in a nightmarish world and an ultimate struggle to survive. Before the relaunch, there were also two Legion titles. 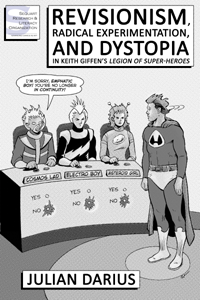 It’s just that the second was titled Adventure Comics; the Legion Lost scenario is what’s new. 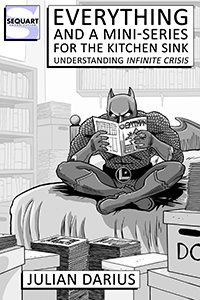 These are unlikely to be best-sellers (the Legion hasn’t been since the 1980s). But given the Legion’s long history and very faithful fans, they’ll likely to do well enough. Of these, one of the breakout hits, surprisingly enough, may well be Aquaman, scripted by Geoff Johns. His profile should be enough to attract some attention, but it’s artist Ivan Reis who seals the deal. He may not have a huge fanbase, but fans are certainly aware of him, having worked with Johns before. Not much is available about the title’s take on the character, but it’s definitely one to watch. Aquaman‘s been relaunched many times over the years, but none of them have stuck, and he hasn’t had a title for most years of DC’s publication. 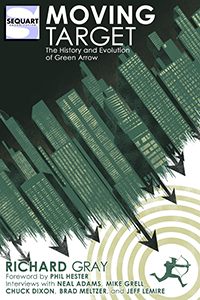 Green Arrow’s been more successful, having had an extended run from the mid-1980s through much of the 1990s, then a popular revival a few years later. Surprisingly, the character’s done comparatively well, in terms of publication history, during this entire period. The new series is written by JT Krul, with art by Dan Jurgens and covers by Brett Booth, none of whom are likely to draw tremendous sales figures on their own, despite Jurgens’s longevity on the comics scene. The new series might be rebooting the character’s history, although this isn’t certain — and by itself, isn’t likely to attract many new readers. Then again, given the character’s relatively successful history, this one might just stick around anyway. Hawkman’s had a troubled history, plagued with continuity revisions. The various Hawkman titles over the years have had radically different takes on the character. The Silver Age title was standard super-hero fare, starring an alien from outer space who dressed up in a hawk outfit. The dark 1980s brought Hawkworld, initially an excellent mini-series and then a lackluster title, that make Hawkman’s planet a dystopian nightmare. The 1990s series was silly ’90s fare. The 2000s series, helmed largely by Geoff Johns, was hailed as a return to form, Johns having previously redefined the character in his JLA, but the series suffered in terms of sales after Johns’s departure. Now, there’s a new Hawkman series, entitled The Savage Hawkman, that doesn’t seem to be doing anything radically different, at least as far as we currently know. It’s written by artist-turned-writer Tony S. Daniel with art by Philip Tan, both of whom are known to Batman fans, so there may be a little carry-over there. But it’s certainly hard seeing this title surviving, unless it goes in a new direction that pleases fans. Firestorm was a brilliant idea, back in the 1970s: a nuclear-based super-hero who had not one but two alter egos, most prominently the young Ronnie Raymond, who fused together to become a super-hero. By all rights, he should’ve become a major DC character, but his series suffered during the 1970s DC Implosion. It returned in the 1980s for a long run that stretched into the early 1990s. In the 2000s, the title returned again, this time with a new black main alter ego, Jason Rusch. In reviving Firestorm, now as Fury of Firestorm (echoing the original title of the 1980s series), DC is split between two conflicting imperatives. The company’s regressionism would demand Ronnie Raymond’s return, since he would seem to represent a kind of golden status quo for the character. On the other hand, DC’s trying to diversify its line, which would tend to point to using Jason Rusch instead. Fortunately, Firestorm always had multiple alter egos, so it’s a simply matter of realizing the opportunity and using both characters. And that’s just what DC has done. Whether the title can survive is another matter. It’s co-written by Ethan Van Sciver and Gail Simone, and Simone certainly is a smart writer with a following. Van Sciver is popular as an artist, and the fact that he’s providing covers for the series will raise its profile. Interior art is provided by Yildiray Cinar, a relative unknown. Firestorm is the kind of title DC fans want to see succeed but aren’t usually thrilled to read, and it’ll take some work to make it catch fire in the current market. Blue Beetle gets another relaunch as well, this one preserving Jaime Reyes as its star, rather than reverting to Ted Kord or even his predecessor, Dan Garrett. (Apparently, all this nostalgic regressivism only applies to the first DC incarnation of characters originally published through other publishers.) This new series is written by Tony Bedard, with art by Ig Guara and covers by Tyler Kirkham. The series is co-written by DC’s Co-Publisher Dan Didio, with Keith Giffen co-writing and penciling. Scott Koblish provides the art. Giffen and Koblish’s cover for the first issue is particularly interesting for its obvious Jack Kirby influence, perhaps paying homage to the fact that Kirby created the original incarnation of the character as O.M.A.C. (which stood for One Man Army Corps). But the artwork also promises silly, Silver Age fun, and its distinctiveness might help this book stand out and at least develop a cult following. Stormwatch is a new incarnation of a title that went through several permutations at WildStorm, the most fondly-remembered being the one written by Warren Ellis, which led directly into his even more successful The Authority. But the violence of The Authority was a bad fit with DC (WildStorm was then a separate imprint). So what we get with this new Stormwatch is apparently a toned-down version of Ellis’s team, featuring at least three of the same characters and set in the DC Universe. The inclusion of Martian Manhunter is a smart touch, given his absence from Justice League (and all other relaunched titles), which might make some DC fans likely to at least try this title. But it’s hard to imagine that DC will include the kind of violence and transgressive ideas that made these characters work originally — and it’s worth noting, on this count, that the title isn’t part of DC’s “dark” push. It’s equally dubious that DC with treat Midnighter and Apollo, Batman and Superman analogues who were engaged in a homosexual relationship in the original Stormwatch and The Authority, in a way that respects their history. Especially since DC’s objection to their relationship, on the grounds that the company was technically publishing a version of Batman and Superman who diddled each other, goes back to the original run of The Authority. Still, fans of these characters have often lamented that their stories never reached the creative heights that they did under Ellis and his immediate successor, Mark Millar. There’s enough hunger for these characters that, should the new title generate good buzz, it could snowball. But fans have every reason to be doubtful. 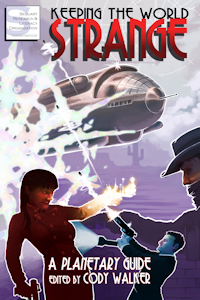 Ex-black ops agent Cole Cash is a charming grifter that few can resist. And yet he’s about to be branded a serial killer when he begins hunting and exterminating inhuman creatures hidden in human form – creatures only he can see. Can the biggest sweet talker of all time talk his way out of this one when even his brother thinks he’s gone over the edge? There’s nothing in this to indicate that the character will now be rooted in the DC Universe, like Martian Manhunter provides for Stormwatch. For what it’s worth, the only other WildStorm-based title, Voodoo (discussed below because it’s part of DC’s “dark” initiative), also makes no such reference. Suicide Squad resurrects a popular series from the late 1980s (as written by John Ostrander) that featured villains sent by the government on suicide missions. It was largely responsible for revitalizing the villain Deadshot and that foreshadowed paramilitary super-teams and proved that villains (at least when combined with a decent premise) could be given a starring role. The series was revived, with a different premise, in a 2001 series that lasted only 12 issues. The concept of uniting villains, including Deadshot, returned in the 2005 mini-series Villains United, where the team (although closer to the Suicide Squad in concept) was called the Secret Six, after another DC property. This lead into a Secret Six mini-series (2006) and ongoing (2008-2011). As part of the Blackest Night crossover, certain cancelled titles were given one additional issue, including Suicide Squad; this issue continued into Secret Six. While Secret Six doesn’t survive into the relaunched DC, it’s only justice that Suicide Squad, which inspired it, does. It is a bit confusing, however, that this new series is written by Adam Glass, rather than John Ostrander, who had guest-written and co-written a few stories for the ongoing Secret Six. Art for the new series is by Marco Rudy. The team’s premise is described exactly like that of the original series, and its initial line-up of villains includes Harley Quinn, Deadshot, and King Shark. Static Shock stars Static, a character originally published by Milestone Comics. DC purchased that company a few years back and promptly incorporated its characters into the DCU, so this isn’t a case of a title that’s doing so for the first time (as with the WildStorm titles and arguably one of the Vertigo ones). But because Static is a young black character (Milestone was a trailblazing attempt at black super-heroes), this series certainly counts towards DC’s goal of diversity, although like most of these titles, it doesn’t star a new character. The series is written by John Rozum and Scott McDaniel, with art by McDaniel and Jonathan Glapion. Of the Milestone characters, Static has been the most successful, probably because he once had his own animated TV show, making him the only Milestone character with such a claim. This new series, like others before, pays homage to this fact in its title, since the animated show was titled Static Shock. Those familiar with the Milestone characters can only regret that other, arguably better characters such as Icon haven’t been given the same treatment. Next up is Mister Terrific, written by Eric Wallace, with art by Roger Robinson and covers by J.G. Jones. Giving Mister Terrific, usually associated with the Justice Society, his own series is obviously part of DC’s diversity goals, given that the character is black, but he’s a smart choice. Not only has the character had a fairly high profile in the DC Universe in the last few years, but he’s a well-conceived character, with intelligence and cool floating spheres. It might be hard to imagine this title surviving, but it’s certainly a noble experiment. As previously mentioned, the relaunched DC line doesn’t include a Justice Society title, a title sure to be sorely missed by many. Given this, it’s nice to at least have a title starring a character associated with the Society. Now, there’s a new Captain Atom. It promises, unlike most of DC’s other offerings, to take the character in a bold new direction. It’s written by JT Krul, with art by Freddie Williams II and covers by Stanley “Artgem” Lau. It would be surprising to see any incarnation of Captain Atom a commercial success, much less one without A-list talent attached, but one never knows with new directions — and any attempt to revive the character boldly is certainly to be applauded. 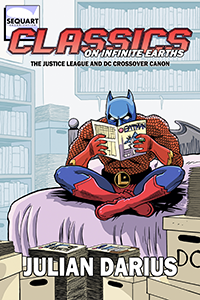 Lastly, there’s a new anthology series — or at least a series starring different characters for each arc: DC Universe Presents. (The title is a play on the old DC Comics Presents, which was mostly a Superman team-up title.) The initial arc stars Deadman and should be considered part of DC’s new magic initiative. It’s written by Paul Jenkins (who previously worked on Vertigo’s Hellblazer), with art by Bernard Chang and covers by Ryan Sook. 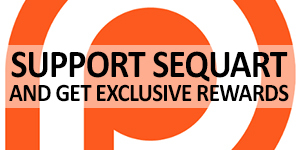 Anthology series don’t tend to fare well in the U.S. market, but they play an important role. This one seems designed to explore characters who might otherwise not warrant their own series, in lieu of the mini-series format, an idea that’s worth applauding, even as we’re suspicious about its odds of survival. Yesterday’s “The Big Guns” examines the relaunch’s offerings for the Justice League, Batman, Green Lantern, Superman, Flash, and Wonder Woman. Tomorrow’s “Non-Super-Hero Offerings” examines the relaunch’s ostensibly non-super-hero titles, including (1) its “dark” magic initiative (tied to the above initial arc on DC Universe Presents), which incorporates some Vertigo characters into the DCU, and (2) the relaunch’s three non-super-hero, non-supernatural titles. Tagged 2011 DC relaunch (the "New 52"), Aquaman, Blue Beetle, Captain Atom, DC Comics, Firestorm, Green Arrow, Grifter, Hawk and Dove, Hawkman, Legion of Super-Heroes, Milestone Comics, Mister Terrific, OMAC, Static, Stormwatch, Suicide Squad, Teen Titans, WildStorm. Bookmark the permalink. Really enjoying the new content after losing track of this website for a spell. The piece is great, Julian. But the pic? I literally cannot take you seriously with that picture at the footer of every article. Why’s that? Any other people want to chime in here? Don’t worry… I can take it! And I’ll gladly defer to the consensus on the matter, if I’m convinced there is one. And thank you, Jonny, for commenting. We’re very glad to have you back! It’s very much appreciated. The cigarette isn’t digital. It was there when the photo was taken. It took me some time to see what you were talking about, given this. But now I can’t look at it without seeing what you’re seeing! Thanks again for your comments. They mean a lot!